As police raid the homes of peaceful activists for Facebook posts critical of the state, rampant illegal threats to murder children and kill people go unchecked and essentially ignored by the social media giant. Over the past month, the social media giant, Facebook, has been in countless headlines ranging from the scope of their data collection to rampant censorship of peaceful groups. The world is now finding out that the social media network they agreed to join is also in the business of mining their data, controlling the narrative, and stifling free speech. These recent revelations about the way people interact with Facebook and the way it can be used to steer public discourse has created a furious debate within the government as well as the private sector. In reality, however, Facebook is a private company. Everything that you see on the platform, you agreed to in its terms of service. This includes censorship, steering political agendas, and even getting banned for calling out the atrocities of war. While much of this madness in which peaceful speech is flagged as offensive and its purveyors banned can be attributed to the algorithmic functions of the software, the Free Thought Project has recently documented an experience with Facebook that shows how dangerously inept this company is in stopping actual criminal acts—even when they are given documented evidence and all the details necessary to do so. Naturally, because the Free Thought Project challenges the status quo, many people out there tend to be quite vocal in their opposition to the ideas of freedom and peace which we openly support. Often times, these people will email, message, or comment wishing us ill will. This is nothing new and most of the time, we simply ignore it. However, this week, we received a message that was impossible to ignore. Sunday night, TFTP received the following message from someone we’ve never heard of or interacted with. TFTP is not in the business of reporting people to Facebook. 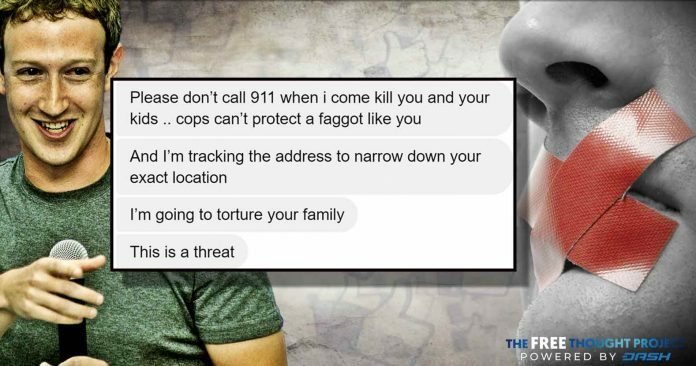 However, this is not a typical threat as he mentions torturing children and sending poison to our address. One would think that this is not the sort of message that Facebook would allow on their platform and do everything in their power to remove it. However, one would be wrong. 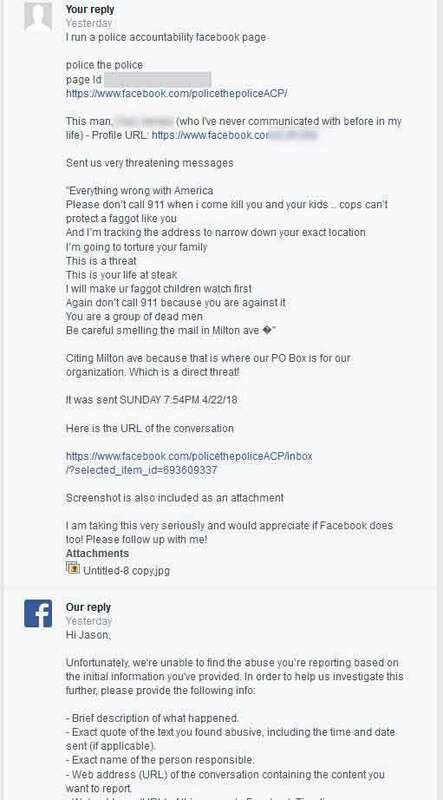 Going through Facebook’s proper channels to report threats, TFTP reported this to Facebook with a link to the man’s profile, a link to the actual message, a screen grab of the message, and a quote of the message. On Monday, Facebook had all the necessary information to see that a man was using their platform to threaten people about torturing and murdering them and their children. One would think that Facebook would quickly respond letting us know that this clear violation of their terms and violation of the law would be swiftly handled. However, again, one would be wrong. Thinking this could possibly be a fluke because we actually sent them more details than they require, we sent in another email, listing every single item they asked for, detailing the crime. We received the same response. Thinking that this has got to be some mistake, TFTP reported it a third time. Third time is a charm, right? 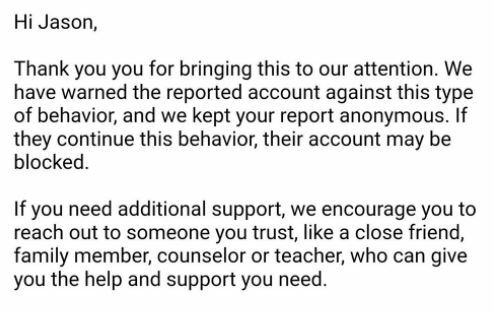 On Thursday, after four attempts at reporting this threat, Facebook finally acknowledged it but said they only issued the man who threatened to murder children—a warning. The sheer lack of concern about someone using their product to threaten child murder is mind boggling on its own. However, if we consider the story of Sarah and Andrew Leach, who TFTP exclusively reported earlier this month, this lack of concern becomes dangerous incompetence. To be clear, TFTP is not calling for Facebook to censor any point of view, offensive language, or any non-threatening communication, no matter how nasty. However, this person is breaking the law, and Facebook appears more concerned with reporting people to the police because they share peaceful posts questioning government. In an exclusive interview with The Free Thought Project, Sarah Leach said that she and her husband, Andrew, were ambushed and detained by a SWAT team for more than 13 hours before they finally received an explanation for their arrest. The evidence the officers claimed to have against them came in the form of a stack of papers that contained detailed screenshots of posts from their Facebook accounts. None of it called for violence, yet this family was raided by a SWAT team after Facebook flagged their content. Once police realized that the couple had committed no crime and didn’t even violate Facebook’s terms, they were set free, but not before they were left severely traumatized. In response to improperly flagged posts on Facebook, several federal agencies wasted taxpayer funds to spy on, detain and interrogate an innocent couple. It is also important to point out that many members of the Free Thought Project team have been banned on Facebook for up to 30 days for sharing completely peaceful memes that simply challenge the status quo. Entire Facebook pages have been taken down for doing nothing other than sharing peaceful content as well. Meanwhile, the man who threatened to murder children gets by with a warning—whatever that means.